When looking for an induction cooktop, it’s too easy to think that once you’ve seen one cooktop model, you’ve pretty much seen them all. I can’t say I blame you if you think this way. After all, just judging purely from appearances, most induction cooktops tend to look alike. They tend to have the same form, the same glass or shiny surface, and similar-looking controls. However, if you take a long hard look at each model, key differences arise. These differences can make or break your induction cooking experience and can go a long way in determining whether you’ve gotten every red cent’s worth of value from the hard-earned dollars you’ve spent on your cooktop. Read on to see why we’ve included it in our list of induction cooktop reviews! Check out our Best Induction Cooktop Reviews and Buying Guide for 2017 here! To make a truly informed choice in what could otherwise be a seemingly generic field of lookalike machines, you have to focus on a model’s heat range, how portable it is, how easy its control panel is, ease of cleanup, the quality of the heat it produces, and how well it accommodates a wide range of pans. On these points, the Duxtop Secura 9100MC Induction Cooktop generally comes out looking good. Although not exactly there as the best rated portable induction cooktop of its category, its low price and solid feature set qualifies it for being described as best price induction cooktop. The Duxtop Secura 9100MC Induction Cooktop has 15 different temperature settings from a low starting temperature of 140 degrees Fahrenheit to its hottest setting of 450 degrees Fahrenheit. This heat range is accompanied with 15 power levels that start at 200 watts and peak at 1800 watts. 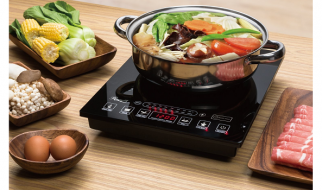 Based on my experience preparing all sorts of dishes on induction cooktops ranging from simply boiling water or eggs to cooking stews, this 15 temperature setting is definitely welcome and oh-so-practical. You aren’t left guessing regarding which heat settings are available. You can also actively manage your cooktop’s electricity consumption by selecting the proper power level. Owing to its roughly square form factor, this model is fairly easy to lug around. Whether you’re moving from one home to another or would like to take an induction cooktop on the road, this unit is easy enough to carry around. Weighing a mere 7.1 pounds this unit is heavy enough to remain in place but not so heavy that it is a chore to carry. It’s low profile and square form makes it very easy to store away. You can save on quite a bit of space because its profile and shape enables you to stack it on other items in a storage area or you can put light items on top of it. 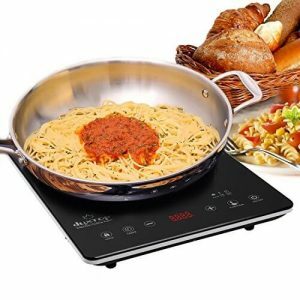 Make no mistake about it, this small induction cooktop is so handy, affordable, and versatile, it can make a serious claim for the title of best portable induction cooktop or best induction cooktop. This unit has a control panel that is easy to use. You don’t have to have a Master’s degree to figure out which setting you’re on or how to change settings through the controls thanks to this unit’s digital control panel. Winding down cooking time is also a no-brainer with this model because it comes with a timer that you can set up to 170 minutes. 170 minutes! That’s almost 3 hours of pre-set control. Best of all, you get fine-tuned scheduling because you can set timer increments by as little as one minute. If you were to get a bit excited stirring the mixture in your pots and pans, you won’t have to worry about anything spilling since you only need to turn off this cooktop and wipe down its top surface. No fuss. No muss. No drama. Its small form factor means you don’t have too wide or long of an area to wipe down. Also, its surface cools down quickly so your spills don’t get stubborn because they dried out. The control panel area has no indentations or crevices so, like the top of this unit, clean up is easy. You only need to soak a sponge or cloth in some soapy water to quickly wipe down this unit with a few motions. Repeat the action with a moist cloth and you’re done. Given this unit’s small portability-friendly form factor, this unit is very convenient to clean for people who are very busy. It doesn’t take much time to both clean up and keep clean. When it comes to any cooktop, heat quality is crucial. First, the unit should heat up very quickly so you can save time and energy (and by extension, money). The Duxtop Secura 9100MC Induction Cooktop does well on this front. It doesn’t take long to heat up at all. However, when it comes to heat distribution, the Duxtop Secura 9100MC Induction Cooktop has issues. It has a hot spot that isn’t distributed evenly on the bottom of the iron clad or composite metal clad ‘heat disk’ of whatever induction cookware you might want to use on this cooktop. This can be a big issue because it would mean that you would have to stir your food actively to ensure it gets the full heat it needs to cook. If you’re not careful, you might be cooking hot dogs or bacon and only part of the items you’re cooking are fully heated. You would have to stir the items quite a bit to reposition them for even cooking. Depending on how many items you’re cooking, you might end up spending a lot of time stirring-a lot more time than you planned. Thankfully, if you’re cooking small cut up pieces or have a small amount of ingredients, this uneven heating issue won’t set you back too much in terms of time and effort. Offsetting the heating issue is the fact this unit comes with the best price for induction cooktops for its particular feature set. Indeed, after factoring in all other criteria, it would be a serious contender for being the best buy induction cooktop in its class. By and large, this cooktop shows a goodly amount of sensitivity to induction cookware. Unlike some extremely sensitive and precise cooktops that require almost a specific brand or model of cookware to operate, the Duxtop Secura 9100MC Induction Cooktop handles almost all induction-friendly or induction-specific cookware as well as your typical cast iron cookware. Regardless of whether the cookware was a ceramic and steel composite or aluminum and steel, most induction cookware works on this model. Given its low price as well as its multiple heat and power settings-all wrapped up in a nice portable footprint, the Duxtop Secura 9100MC Induction Cooktop has all your induction cooking needs covered in most settings. Unless you’re looking for induction cooking under extreme circumstances, this model should meet most, if not all, your needs. 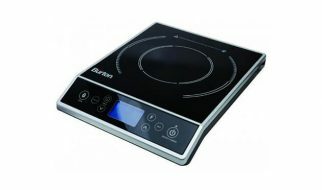 For its price range and feature set, this model is definitely a contender for best portable induction burner. While it still has some room for improvement for it to be considered the best rated portable induction range, we’re sure that its solid combination of features would make its owners claim that it is the best range portable induction cooktop for their needs.